I’m never exactly sure what the term guilt trip means. Does it mean I am on a journey of negative feelings? Or that my guilt made me stumble? Let’s look at how guilt originates. We all experience it. 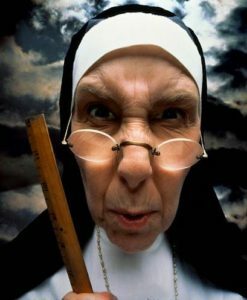 From the days when the nuns smacked the back of our hands in St. Margaret School, to the Jewish mother’s lament: “You nevah cawl your mutha any mowah.” Every culture has ways to bestow—or, more accurately, attach—guilt. As I’ve observed and experienced guilt, I’ve come to believe it is a family of feelings attached to some Knower/Judger rules we’ve learned. I’ve spent considerable time examining a particular universal rule: that we tend to feel bad when we say no to someone. Many of us were taught—either by direct rules or behavioral influence—that saying no to someone’s request is a bad thing. To prevent our personal feelings of guilt, we may say: “Maybe… I’ll think about it… or sound’s good, I’ll get back to you.” Sometimes we don’t respond at all. We mistakenly believe that this approach is better than looking someone in the eye and saying no. We all have them—those little voices in our heads that drag us away from getting what we want. We fail to be clear with ourselves and with others. We don’t work things out the way we want to because, if we do, we will punish ourselves with guilt. It’s our internal conditioning engine our K/J puts in place to keep us in line. When I was an undergrad psychology student, we taught animals—mostly rats but sometimes college sophomores—to not do things. We prevented them from turning left, running, and other activities by punishing them, usually with electrical shocks, when they performed the undesired behavior. We also rewarded them, typically with food pellets, for doing what we wanted them to do. Conditioning is how we establish our rules of life. Our parents yell at us for running in the house and hug us for smiling at Grandma. When we’re around two years old, we hear no so often that we become compelled to disobey. And guess what? When we do this, when we try the things that are against the rules, we get in trouble. The cycle repeats itself enough times to deeply ingrain the rule in us. Now that I’m an adult, I find myself frequently torn between my limited resources—time and sometimes money—and someone else’s idea about how I should invest them. When we experience guilt about saying no, it’s because we’re not sure which requests violate our aspirations and desires. We can’t get to what we want. When my friends and I penned the book, The Positive Power of NO, more than 10 years ago, I tackled the concept of re-writing the no rule. Before that, there was always a fuzzy boundary between yes and no. My standard response was usually maybe. To avoid guilt, I weaseled out. By clarifying the boundary between acceptable and non-acceptable requests, whether they are quantitative or qualitative, I now know my answer in advance. Stress resolved. Guilt evaded. Now we’re 30 to 60 years old. The consequences are not the same. We no longer get a spanking when we do something wrong. We are grownups, and we can have what we want, without guilt. We can manage our resources to our benefit, without guilt. What limits us from doing this is that inner voice of Mommy, Daddy, a teacher, a minister, or some critically memorable event telling us that if we break the rule, we will experience negative, sometimes paralyzing, feelings of guilt. Ask yourself: “Am I on a journey of negative feelings, or are negative feelings making me stumble?” Pick one; they both apply. Eliminate guilt trips by invalidating the rule you created when you were a powerless child at another time. Unpack your suitcase.